118 I WRAPS I 2015 T o o l s & e q u i p m e n T 1) Clean the Surface—We recommend using a three-step process: • Degrease surface. • Wipe down the entire vehicle with denatured alcohol. • Wipe down the entire vehicle with a new microfiber cloth and 70% isopropyl alcohol. 2) Pre-Heat—This is done before stretching the film. Heat the area of film that you want to stretch to 104°F – 122°F (86°F – 104°F for carbon fiber) depending on thickness of the film. You will see the vinyl become relaxed. 3) Post-Heat—After you have installed the vinyl and trimmed the excess you will need to heat the edges and any other areas that have tension to 176°F – 194°F. This will set the adhesive in place and erase the memory of the film. 4) Ambient Temperature—Try to always install vinyl in an area with an ambient temperature around 64°F – 77°F and moderate humidity. 5) Use a Temperature Laser Gun—Do some research to find the right one for you. The price is all over the place and there are reasons for that. These guns range from $30 to $600. I have found that $80 to $175 seems to be the best for what we do. Textured Films Textured films like alligator, carbon fiber, leather and brushed metal are multi- layered premium cast vinyl. 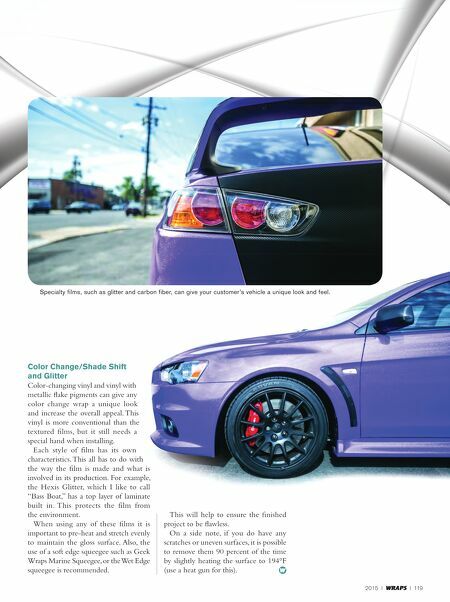 These films can give your customer's vehicle a unique look and feel. Sounds simple right? Not so much. First the installer needs to be careful because of the "multi-layered" technology. Because the film is not smooth, it must be installed with a little more care than your average cast film. Textured films are delicate because of the peaks and valleys in the vinyl—which gives it the 3D look and feel—and this creates issues you need to be aware of. When installing, preheating and/or pre- stretching needs to be done with caution. The heat will affect the thinner layers of the vinyl first, which in turn will allow the film to stretch faster, which causes an already thin piece of film to become thinner—a "weak spot" if you will. Because of this, when you post heat it, it's more likely to split. So when using textured films, use low heat for stretching. Post heating should be done with a heat gun as opposed to a torch. In my opinion, a heat gun provides a more even heat and is easier to control. 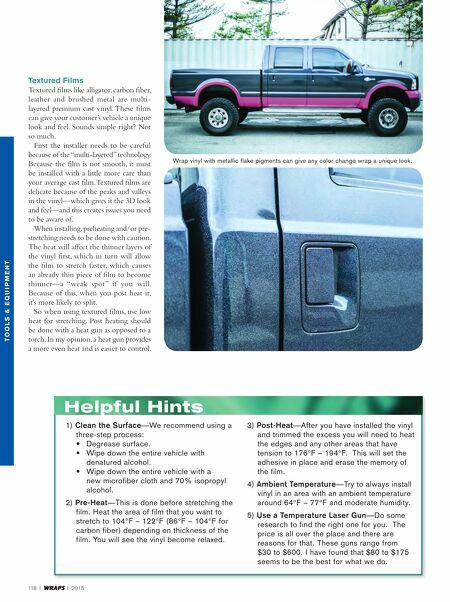 Helpful Hints Wrap vinyl with metallic flake pigments can give any color change wrap a unique look.